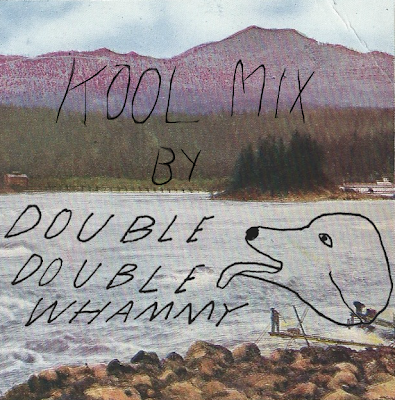 A Monday Mix from our friends at Double Double Whammy. One of the best perks about running our own blog is that we get to meet a lot of people who are doing really cool things with music and art. If we had never started THE LE SIGH, we might not have ever been introduced to the great people over at Double Double Whammy, a small record label that has put out records and cassettes by excellent bands such as Spook Houses, LVL UP, and Crying. While we definitely would have known about the label sans blog, we wouldn't have been able to grace this wonderful Monday Mix upon your ears without it. This week's Monday Mix was curated by the handsome Dave Benton, who must be pretty busy running Double Double Whammy and being a member of both LVL UP and Spook Houses. Dave made one of my favorite mixes yet and not just because he reintroduced me to the perfection of Broadcast's "Echo Answer". It's as if he looked into the brains of the girls behind the blog and knew exactly what we would want to hear on a mix (also we probably have similar music tastes). "Here we go! Rock 'N' Roll ladies coming at ya from DDW! We've got a lot of nice gems on this one. A few oldies that are near and dear to our hearts, and a good ol' handful of tracks from friends and family. Sounds range from quiet slumber-punk to all-out rock and roll 2 the wall get your earplugs STYLE. Enjoy!" Kool Mix: The Le Sigh x DDW from dbldblwhmmy on 8tracks Radio. For more check out Double Double Whammy's website.